You are God's lesson in patience for me Grey, there's no doubt about that. But you're also God's gift of affection, doling out the most lovable snuggles and kisses I've ever received. When you look up at me with those curious green eyes and McDonald's arch eyebrows, you melt my heart. "Can I eat your face Grey?" I'll say just to hear you laugh. "Noooooo Mommy! You're silly! You can't eat my face!" But the truth is I want to ... 'cause it's just so dang cute. It was a record shattering 70-degree day in late February when you and I took these "family photos" as you call them. Headed to Central Park like pretty much everyone else, we stopped to take a couple shots in a brick alleyway. You like to work quickly - just snap the photos and be on our way to the next destination. I sauntered behind you in the park, grinning from the comments overheard about your pint-sized swagger -- "Did you see that little boy?!" -- as you walked past confidently rocking your sunglasses and newsboy hat. You seemed to know exactly where you were going - a true city kid - which was entertaining for me and the others in your orbit. And the truth is, that fierce independence has always been yours. For as long as I've known you, you have been bold, brave and unabashed. Which is exactly why I sometimes have to crack the whip. Like the other day when you and Cash (just imagine what's it's like when the two of you are insubordinately synchronized!) were acting up on the subway home from school. You guys got on my last nerve - actin' a fool, not listening, getting handsy with each other - so I pulled you both off the subway car at the 135h street and said we were walking the last 12 blocks home ---- at my pace! The two of you scrambled behind me as I storm trooped north toward our apartment. You guys arrived with weary legs and slightly winded, but seemed to have a rekindled understanding of my follow-through. And the next morning Grey, as we headed down into the subway you said, "This time I'm going to listen to you - wight Mommy?!" "Right my love. I know you will." I've noticed that whenever Daddy and I get frustrated you'll often say, "It's okay. I'm still happy!" which is classic Grey! You may be God's lesson in patience but you are most certainly our quintessential joy boy! Our "Joy Boy" with the stunning eyes and blonde curly q's. 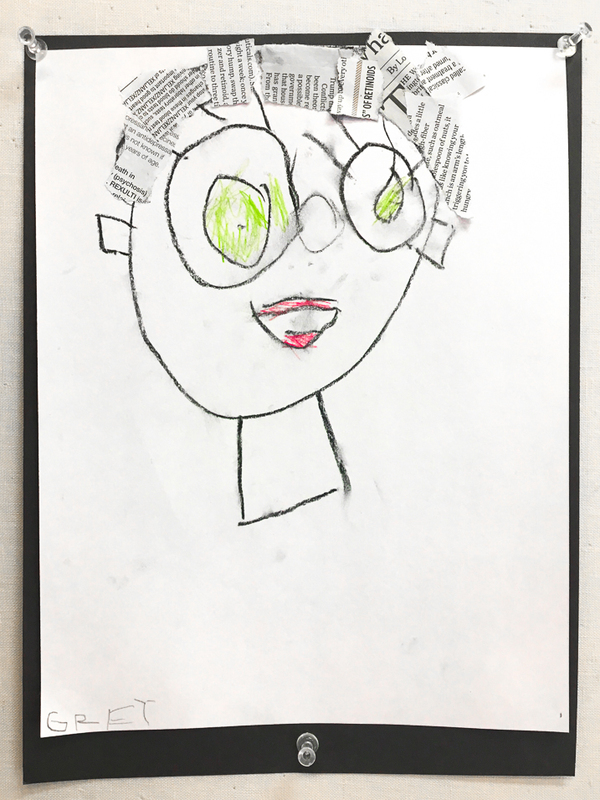 Take a look at these two recent self-portraits you made in preschool. I just love the green color of your eyes and the ways in which you showed the texture of your hair! You are such a lover boy Grey Bear - like "for reals" as you say. My truest gift of affection. One of my favorites is when you ask me to lie down with you after you've had a bad dream, grabbing my hand to kiss it. "I love you 80 degrees Mommy" to which I always say, "I love you 10,000 miles." And how you love your brother! You are most excited to go to MCS next year so you can be with Cash. "We can hold hands all day 'cause he's my bruhdder, wight Mommy?!" Right my love. And you know what else? You are easily the coolest cat under 50 inches walking these city streets. 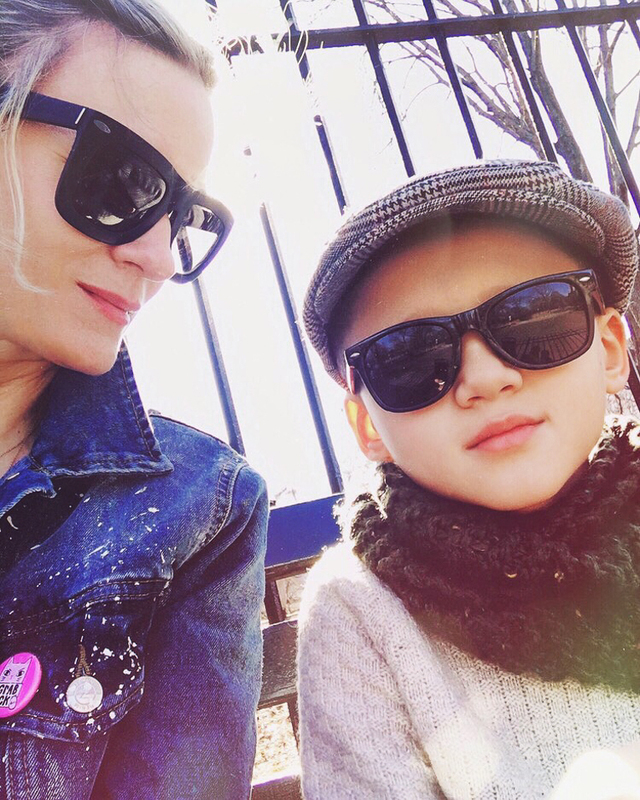 I'm so honored to be your mother, sharing a seat next to you in the park on a beautiful day. Every day. I love you Grey Grey. TEN THOUSAND MILES!